AW Series pneumatic actuators are divided into double-acting and single acting (spring return), two sub-cylinder gas, the output torque, balanced and flexible movement; hard chromium plated piston rod, good wear resistance; all sliding between parts with or without oil lubrication shaft and guide ring to reduce friction and prolong the life of AW pneumatic actuator output torque characteristic U-shaped curve is more suitable for large-diameter ball valve, butterfly valve stroke corner Kai, closed and regulation, can also be used for other rotary movement of the occasion, is to achieve the ideal of industrial automation control device pipeline. Table, the minimum time to close the valve spring torque is the torque, maximum torque is to open the valve spring torque. 1, double-acting actuators: valve opening and closing of two control. 2, single-acting actuator (spring return): In the circuit, gas cut off or fails, automatically close the valve. 3, single solenoid valve: open or close the supply valve, the valve closed or open, when power failure (explosion proof available). 4, double solenoid valve: a valve open when the coil is energized, the other coil is energized, the valve closes, with memory function (available in explosion-proof). 5, limit switch back to the hearing: long-distance transmission valve open or closed position signals (explosion proof available). 6, electrical locator: According to the current signal (4 ~ 20MA) the size of the media flow control valve control (available in explosion-proof). 7, pneumatic converter: the current signals into pressure signals, and supporting the use of pneumatic positioner (providing explosion proof). 8, pneumatic positioner: According to the current signal (Standard 0.02 ~ 0.1MPA) the size of the media flow control valve control. 9, Air Treatment FRL: including air relief valve, filter, lubricator. Of the gas source stable, clean and lubricate moving parts. HART institutions: automatic control under normal circumstances you can not manually open and close the valve. 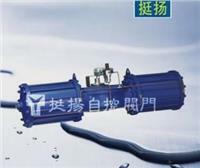 1, the pneumatic actuator can be directly connected with the valve, brackets and fittings can also be connected with the valve installation. Fasteners must not loose connection. 2, to ensure that the actuator output shaft coaxial with the valve stem is installed, and turn the flexible non-crawling phenomenon. 3, connecting pipes, fittings, accessories, etc. should be clean. 4, solenoid valve scheduled port is always down, when the level up or when the pipe should be connected so that the exhaust downward. 5, testing should be determined before the channel clear air, pressure, voltage, signals meet the requirements. 6, compressed air should be filtered, dried, dew point -15 ℃ to dehumidify the following. 7, solenoid valve should open when debugging to the automatic position. 8, pneumatic operation, the device should be disconnected manually, manually operated pneumatic devices should be disconnected. 10, under normal operating conditions once a month, once a year overhaul.